—St. 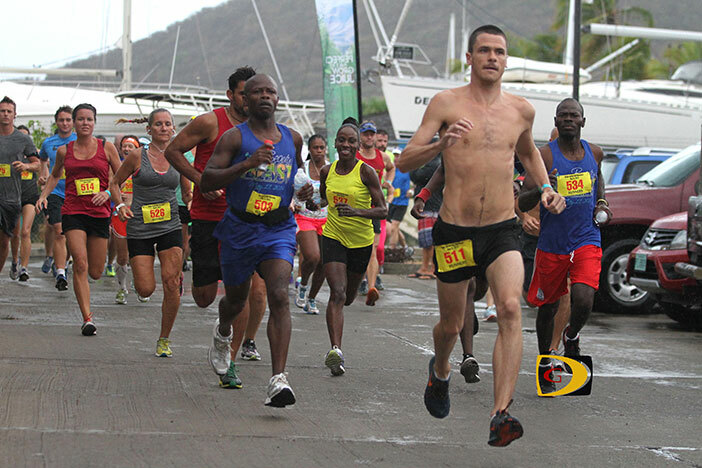 John’s Timothy “TJ” Hindes sprinted away from the pack at the start—using the same strategy he employed last year—then went on to become the first repeat winner in the four year history of the grueling Virgin Gorda Half Marathon, improving his own course record in the process. Hindes set off on a punishing pace up to Nail Bay with Reuben Stoby his only serious pursuer in tow, returned then circled The Valley including historic Coppermine and the Baths to win in 1 hour 32 minutes and 05 seconds improving on the 1:32.34 mark from last year. Stoby was six minutes back in 1:38.23. Stoby said he was putting his bag in the truck when the race started and it threw him off his race plan. “Hindes starts very quickly so it was difficult trying to catch him and hold him, so eventually, I just had to settle for second,” he said, noting that excruciating could hardly describe chasing Hindes up to Nail Bay. “It’s one of the toughest courses for sure. Like Hindes, Katrina Crumpler defended her women’s title. Crumpler—between Marathons after a personal best of 3 hours 22 minutes and 53 seconds in Boston last month and ahead of the May 24 Buffalo Marathon—chopped five minutes off last year’s mark finishing in 1:47.35. Final Results. Men: 1. Timothy “TJ” Hindes 1 hour, 32 and 05 seconds, (New course record. Old record, Hindes, 1:32.34, 2014) .2. Reuben Stoby, 1:38.23. 3. Julius Farley, 1:41.01. 4. Rodrigo DosSantos, 1:42.23. 5. Chris Thomas, 1:46.35. 6. Paul Hubbard, 1:48:14. 7. Curwin Andrews, 1:50:10. 8. Ezron Simmons, 1:58.59. 9. Russell Crumpler, 1:59.26. 10. Allan Cundall, 1:59.29. 11. Richard Morgan, 2:00.21. 12. Ryan Blanchard, 2:02.33. 13. Ciaran O’Shaughnessy, 2:04.26. 13. Joseph McIvor, 2:06.49. 14. Marco Bava, 2:06.53. 15. Damien Lysiak, 2:07.14. 16. Gareth Watkins, 2:08.29. 17. Adrian Dale, 2:08.49. 18. Keith Williams, 2:09.16. 19. Kenton Jones, 2:13.20. 20. Shane Donovan, 2:15.01. 21. 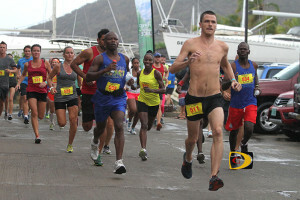 Guy Paul Dubois, 2:16.41. 22. Michael Reiter, 2:17.46. 23. Christie Brown. 2:19.07. 24. Jermain Abreams, 2:19.24. 25. Joshua Rossiter, 2:22.58. 26. Alex Smith, 2:28.06. 27. Keith Regan, 2:32.18, 28. Arun Keshap, 2:33.51, 29. Ruairi Bourke, 2:36.38. 31. Scott Butz, 2:46.15. 32. Zoltan Birinyi, 3:14:33. Women: 1. Katrina Crumpler, 1:47.37. (New record. Old Record, Crumpler, 1:52.55, 2014). 2. Beth Simmons, 1:49.36. 3. Jenny McIvor, 1:53.36. 4. Kathleen Brownsdon, 1:56.10. 5. Rosmond Johnson, 1:59.37. 6. Serena Krueger, 2:00.21. 7. Caitlin Goodwin, 2:04.36. 8. Kay Reddy, 2:08.02. 9. Nadine Leslie, 2:09.03. 10. Anna Kinkead, 2:16.04. 11. Jessica Miles, 2:17.42. 12. Kerry Ann DosSantos, 2:22.10. 13. Philomena Robertson, 2:28.17. 14. Rhiannon Davies, 2:29.43. 15. Amoi Foerstel, 2:30.41. 16. Alexandrea DeJarnett, 2:30.44. 17. Sarah Hayes, 2:32.43. 18. Andrea Sorlie, 2:36.54. 19. AJ Syrett, 2:42.43. 20. Natasha Lysiak, 2:45.25. 21. Becca Knight, 2:46.22. 22. Ann Marie Rivard, 2:49.43. 23. Brianne Leary, 2:49.44. 24. Jude Holmes, 2:53.10, 25. Jill Farley, 3:02:13. 6 Mile Challenge, Men: 1. Jacob Reed Stolzenfels, 49:02. 2. Kyle Vestermarks, 53:58. 3. Adam D’Monte, 54:07. 4. Erik Remar, 54:32. 5. Lewis Munn, 1:04.23. 6. Merwin Rodriguez, 1:04.26. 7. James Morrin, 1:04.35. 8. Ethan Lysiak, 1:06.03. 9. Steve Biery, 1:07.53. 10. Noah Fox, 1:09.19. 11. Chris Fraser, 1:09.20. 12. Wilbert Samuel, 1:09.21. 13. Adam Holdt, 1:10.08. 14. David Cattie, 1:13.05. 15. Alex Holliday, 1:32:16. Women: 1. Lindsay Wilson, 58:38. 2. Christine Sheehan,1:00.48. 3. Denell Vestermarks, 1:01.05. 4. Leanne Munn, 1:01.39. 5. Julie Lonski, 1:05.34. 6. Stephanie Wessels, 1:05.46. 7. Clair Burke, 1:05.55. 8. Diane Stolmar, 1:08.23. 9. Jewellyn Gerald, 1:08.35. 10. Kimberly Cole, 1:09.02. 11. Karen Morrison, 1:09.20. 12. Candy Holdt, 1:10.07. 13. Beth Besom, 1:12.15. 14. Abriel Lysiak, 1:18.11. 15. Kirsten Vlietstra, 1:24.49. 16. Audrey Penn, 1:27.01. 17. Chris Yates, 1:29.34.,] 18. Ashley Helb, 1:30.10. 19. Noni Georges, 1:30.44. 20. Charlene Odango, 1:34.49. 21. Rodessa Ordoyo, 1:34.50. 22. JoAnn Manlapaz, 1:34:51. 23. Betty Paradisi, 1:35:58. 24. Lisa Brown, 1:36.09. 25. Kristen Collins, 1:40.27. 26. Chloe King, 1:40.28.